In need of some Umbrellas and Shades? Contact the professionals at Picnic Furniture for long lasting all American made shades. All of our commercial umbrellas and shades are crafted by reputable manufacturers such as Frankford, Fiberbuilt, and Superior Shade. We provide both flexible fiberglass and sturdy aluminum ribs on our market umbrellas for areas with high winds and demanding weather conditions. Our commercial patio umbrella canopies are made with quality marine grade fabrics from brands such as Sunbrella, Outdura, and Rececril specially designed to prevent tearing and fading. Including a wide variety of different canopy sizes, shapes, and colors that would accommodate any outdoor venue. Perfect for high-end hotels, resorts, public parks, and restaurants. Enjoy comfortable shade and peace of mind with up to a 7-year warranty on all products. Call today to receive a quote with money-saving quantity discounts. 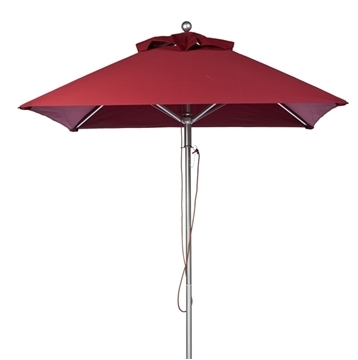 Contract Umbrellas - Styles include market, patio, and cantilever umbrellas featuring canopy shapes of octagonal, square, and hexagonal. Shades made from name brand marine grade fabrics such as Sunbrella, Outdura, and Rececril are supported by durable aluminum or flexible fiberglass ribs. Choose between our many lift options from manual lift to pulley or crank to auto tilt that will best fit your patron's needs. The standard 1.5" diameter poles are crafted from powder-coated aluminum or hardwood for a longlasting investment. Shade Structures - Heavy duty permanent shade solution for any outdoor venues such as parks or playgrounds. Provides a large area of artificial shade to protect guests from overheating or sunburn. Extend the life of picnic tables, playground equipment, and benches by protecting the investments from harmful effects of the sun, rain, and hail. The frames are structured from robust powder coated steel which comes with the option of in ground or surface mount. Canopies are fade resistant made from polyethylene fabrics. Shade structures are wind rated at 93 mph and are supported by a 10-year commercial warranty. 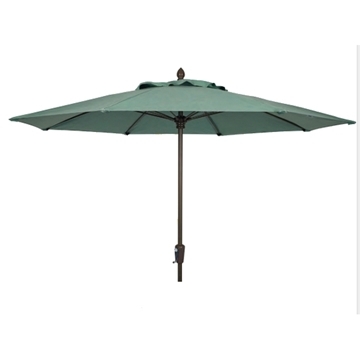 Umbrella Bases - Secures umbrellas either under the table or with freestanding support. Shell materials available in steel, resin, aluminum, concrete, or fiberglass. Comes in a wide variety of shapes and colors that will match any decor. For a safe cost-efficient umbrella anchor consider the UBrace to prevent wind uplift.